Sunelec is one of the most experienced solar power specialists in Australia. Since 2002 we have been helping families and businesses to harvest clean, renewable energy from the sun and to give back to the earth, while increasing their independence from energy providers. But it isn’t just our business that has been around for a long time; our founder has been installing solar power for over 30 years – he was one of the pioneers in the industry. When we say we know and understand solar power, we mean it! Because we believe in taking the longer view, we only recommend solar panels and systems that are built to last, designed and built by solid and reliable companies that have been around for years. We have seen too many fly-by-night companies go for quick profits and lure people in with cheap imports that quickly break down with no warranty recourse as the company folds and runs, leaving people worse off than when they started. With solar, quality and reliability cost a bit more. In our opinion, it is simply not worth the risk to go with untested brands. We provide you with support every step of the way from your first enquiry through to installation and beyond. You are never left wondering what is happening, what a piece of jargon means, or how to do something. We are there when and where you need us. If you need more complex technical questions answered or have any warranty issues, our solar specialists are also happy to help. We are there for you for the long term. We understand that buying a solar power system raises lots of questions. 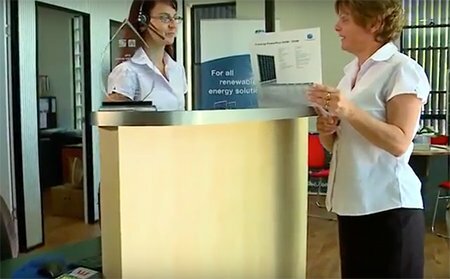 We don’t hide behind call centres and pushy salespeople, but instead, we encourage you to visit our showroom in Clontarf, Brisbane so you can see and test drive our range of working solar power systems and discover which is the right one for your needs. Of course, we are also happy to talk you through your options over the phone, via email or face-to-face. Solar power and the smart use of electricity go hand in hand. That’s why we offer a wide range of solar battery grids including the Tesla Powerwall, LG Battery and BYD Batteries for people who want to maximise the use of their harvested power throughout the day and evening. We also provide full solar off-grid electricity solutions including wind turbines to rural and remote properties across Australia. Our founders lived off grid for several years, so understand the unique challenges that this can bring. Other ways that we can help you minimise your electricity spend include solar hot water for reliable, money effective solar hot water for your home or property, and LED conversions for more energy efficient lighting. Sunelec are licenced electrical contractors and offer quality residential and commercial electrical services across Brisbane.